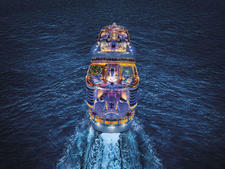 Since its debut in 2009, Oasis of the Seas has continued to turn the cruise world upside down. With first-in-cruising innovations like a zip line, a carousel, a levitating bar and real, live trees, it commands respect -- even from those who argue its massive size doesn't appeal. In addition to being the largest ship at sea, it's arguably the most well-known. So where does that leave Royal Caribbean's newest ship, Quantum of the Seas, and how can it possibly step out of the shadow of its behemoth fleetmate? Below we've compiled a list of offerings on both ships to show you exactly what you'll find onboard when you pit Quantum of the Seas versus Oasis of the Seas. Although these two vessels share some of the same venues and amenities, there's a lot that sets them apart, and each provides an experience all its own. Read on to compare Quantum of the Seas and Oasis of the Seas to figure out which of these groundbreaking ships is the right fit for you. To the right: Quantum of the Seas (top) and Oasis of the Seas. Photo appears courtesy of RCI. If you'd rather wake up to trees than ocean views, try a balcony cabin that overlooks Oasis' Central Park or Boardwalk "neighborhood." When you compare Quantum's cabins, you'll find they are, on average, nine percent larger than those on Oasis. Solo cruisers don't have to worry about dreaded single supplements, either. Twenty-eight studio cabins (12 with balconies) are available for anyone cruising alone. Meanwhile, "virtual balcony" interior cabins offer real-time ocean views via floor-to-ceiling LED screens, and family connected suites combine three cabin types to accommodate larger groups. Royal Caribbean ships offer several similar stateroom categories across the fleet, but Oasis and Quantum have a couple notable stateroom standouts. 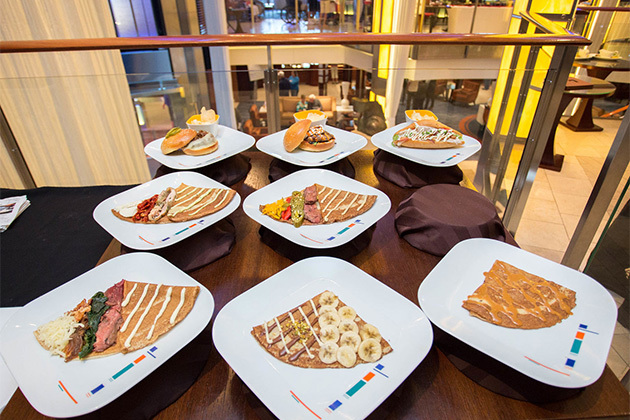 Following its recent dry dock, Oasis received Mexican restaurant Sabor, as well as the Boardwalk Dog House, which originally debuted on sister ship Allure of the Seas. Oasis also offers for-fee options at Giovanni's Table, featuring Italian fare, and upscale 150 Central Park, which boasts a rotating six-course menu. If you're looking for a quick bite, the Cafe @ Two70 offers gratis picnic-type fare with 270-degree views. Another quick option is the SeaPlex Dog House, the first food truck at sea, featuring free gourmet hotdogs and sausages. The Rising Tide Bar, which debuted on Oasis of the Seas, is set on hydraulics and travels between the Royal Promenade and Central Park. In its Bionic Bar, Quantum will feature robotic bartenders. Passengers order drinks via tablets and can then watch as the robots (more like mechanical arms, really) prepare them. Vintages, a swanky wine bar where passengers can try new or favorite beverages, is featured on both ships. For breathtaking entertainment that combines aerial and aquatic feats with the ship's wake as the backdrop, you won't want to miss performances at the AquaTheater on the ship's Boardwalk, where you'll also find a carousel. Look up in the sky, and you'll see fellow passengers whizzing by on the sports deck's zipline. Try any number of at-sea firsts on Quantum, including a visit to North Star. Best for those without a fear of heights, the glass pod, positioned on a mechanical arm, will raise passengers 300 feet above sea level for 360-degree views. Meanwhile, SeaPlex triples as a venue for basketball, roller skating and bumper cars. Adrenaline junkies will appreciate trapeze classes and a RipCord by iFly skydiving simulator. A handful of RCI ships offer Broadway productions as part of their theater entertainment. Oasis, where cruisers can catch performances of CATS, and Quantum, featuring Mamma Mia!, are no exception. 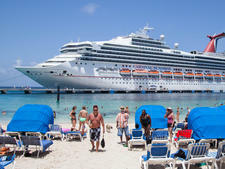 Both ships also feature rock climbing walls and the line's signature FlowRider surf simulators. Oasis' Adventure Ocean is housed in one giant expanse on the same deck. In addition to exclusive areas separated by age group, there's a science lab, a workshop and even a theater, where participants rehearse before performing for their parents at the end of each sailing. Quantum's Adventure Ocean spans two decks, and it features a science lab as well as a cool teen space will provide a similar experience to that found on Oasis. Both ships showcase Royal Caribbean's stellar kids offerings, each boasting extensive Adventure Ocean facilities. The line also has a partnership with DreamWorks, and cruisers can enjoy parades and meet-and-greets that feature Shrek, Fiona and other characters These two vessels also include the H2O Zone, where young cruisers will find splash pools and colorful sculptures that spray water.